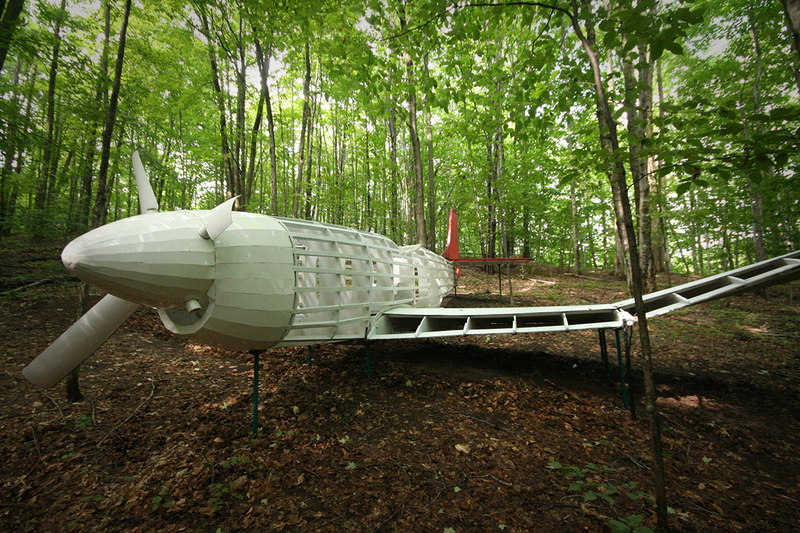 Fallen Comrade is sculptor David Greenwood’s stylized interpretation of a P-51 “Mustang”, a fighter plane that played a dominant role in World War II air battles. Resting in a natural wooded hollow, it now gleans only glimpses of open sky. Its site promotes a gentle, harmonious sensation. 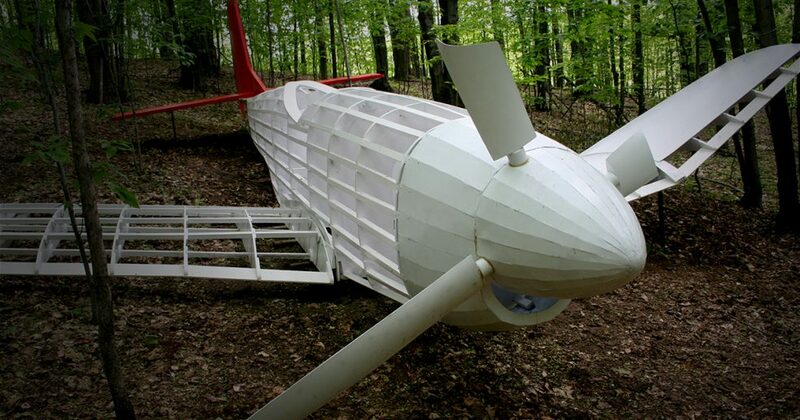 Greenwood has designed his plane to create a spiritual, dream-like impression. This sculpture is, in part, a tribute to the valor and skill of the famed Tuskegee Airmen, the African American squadron of fighter pilots whose World War II record was heroic on two fronts—in air combat as well as in breaking the barriers of racism in the U.S. military. Prior to their service, no black pilots had been allowed in the ranks of the U.S. Army Air Corps. Trained at the Tuskegee Institute in Tuskegee, Alabama, they met the highest standards in qualifying to serve their country as pilots despite the imposition of restrictions designed to exclude them. Many of the Tuskegee Airmen returned after the war to reside in Michigan. This sculpture prompts us to remember those who fought for our personal and national freedom even as they were denied their own. The P-51 is a great example of engineering and technical genius, a valuable component of the evolution of aviation. Mustangs were flown by numerous other Army Air Corps divisions. The P-51 “Red Tails” serve as the distinctive insignia of the Tuskegee squadron. The physical elements of the once mighty Mustang are silenced… poignant, earthbound. Questions still fly. Who was the pilot, the Icarus, who defied the forces of sun and gravity? Each pilot was young. Each pilot saw and felt what few others can ever know; yet repeatedly climbed back into the fragile plane. 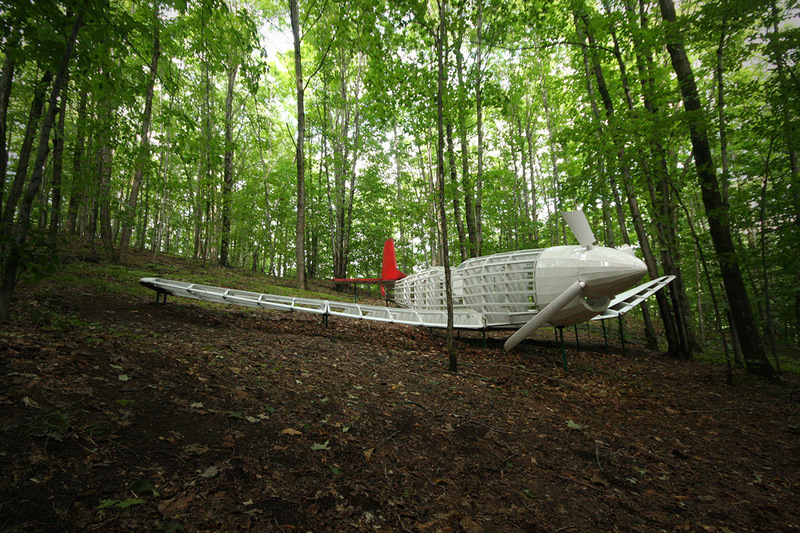 Why is Fallen Comrade in an art park of natural trails? Because it exemplifies a range of human experiences, from the youth dreaming of flying to the mature engineers, fabricators, pilots, and, yes, artists. Notice how the artist does not simply illustrate the military function of the P-51 but interprets its historical reverberations in a way that can ignite the viewer’s imagination. The sculpture provokes challenges to every thoughtful visitor. Fallen Comrade is a prime example of how expressive contemporary sculpture can salvage fresh, even mystical experiences from history.